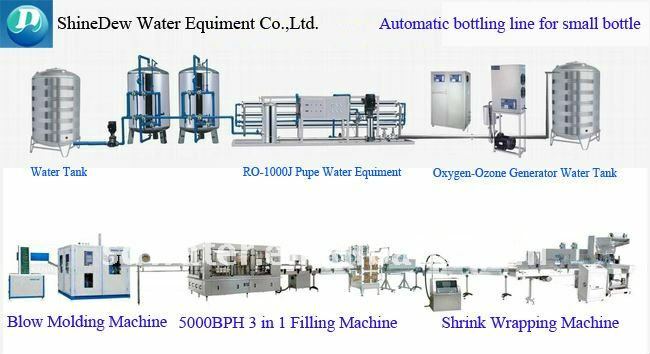 Shine Dew Water Equipment Co., Ltd.is a specialized manufacturer of drinking water treatment equipment, auto bottling machines, labeling machines and other auxiliary equipment, with more than 10 years of experience in China. We have exported our machines to Central and South America, Africa, the Middle East and Southeast Asia. Furthermore, we have completed many turnkey projects of water treatment factories for our customers from the above-mentioned regions. 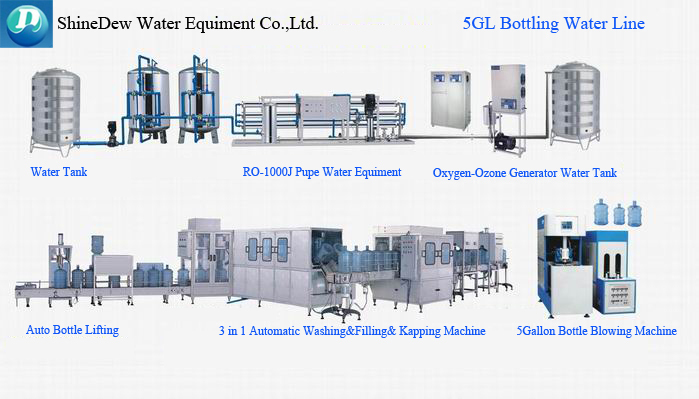 Moreover, we can also provide turnkey services for water bottling plants and beverage production plants. Bottles on conveyor are controlled by counting sensor and delivered to rinsing seats. Stop cylinder, ratchet and bottle clip work to upturn bottles 1800C into rinsing seats, water pump starts to spray inside and then bottles return through the circle. Bottles on conveyor are controlled by counting sensor and delivered to filling seats, then up-loading cylinder works to lift bottles from conveyor and bottle clips make bottles fixed. Filling valve falls by pressure cylinder and filling pump works. Filling time, volume are set by PLC and can be adjusted by touch screen. 1. 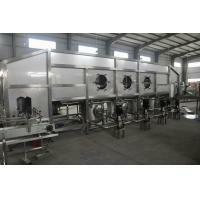 We need you to advise us what kind of drinking water that you want to manufacture. Is it pure water, mineral water or beverage? 2. We need you to tell us the kind of your source water, and you need to provide us Source Water Testing Analysis Report. 3. Please tell us the production capacity of the machine that you demand, so that we can recommend the suitable machine to you and present quotation solution for you. 4. Please tell us the type of electric Voltage, Frequency in your country. Best service for you, and welcome to Shine Dew.